It was a bumper day for Canadians in the MLS SuperDraft in Chicago on Friday with three taken in the top 10 and two more in the second round. UNC-Charlotte centre back Callum Montgomery (Lantzville, B.C) led the way, going fourth overall to FC Dallas. The 21-year-old joins Cyle Larin (first overall in 2015), and Kyle Bekker (third overall, 2013) as the only Canadians to be drafted in the top five of the MLS draft. The 19-year-old Buchanan, a speedy attacker from Brampton, Ont., had been touted as a possible first overall selection. Instead, expansion FC Cincinnati took UCLA midfielder Frankie Amaya, a U.S. under-20 international, with the first pick at McCormick Place. Amaya is the sixth UCLA player to go first overall in the draft, the most of any school. Born on Sept. 26, 2000, he is also the first player born in 2000 or later to be selected. Syracuse defender Kamal Miller, a 21-year-old from Toronto, went to Orlando in the second round (27th overall) and Simon Fraser University midfielder-forward Mamadi Camara, a 23-year-old from Montreal, was taken by San Jose (46th overall). The first two rounds were held Friday. Rounds 3 and 4 are scheduled for Monday via conference call. Toronto FC used the sixth overall pick on Indiana winger Griffin Dorsey, a U.S. under-20 international. Montreal and Vancouver had previously traded away their first-round picks in deals for forwards Maxi Urruti and Kei Kamara, respectively. The Impact used their second-round pick (34th overall) to take Maryland's Amar Sejdic. The 22-year-old German-born midfielder had 22 goals and 16 assists in four seasons with the Terrapins. Vancouver took Georgetown defender Brendan McDonough with the next pick (35th overall). A North Carolina native, the 22-year-old Hoyas captain spent time training in Germany. McDonough's father Terry is the vice-president, player personnel, for the NFL's Arizona Cardinals. Toronto took University of Louisville midfielder Adam Wilson with its second-round pick (39th overall). 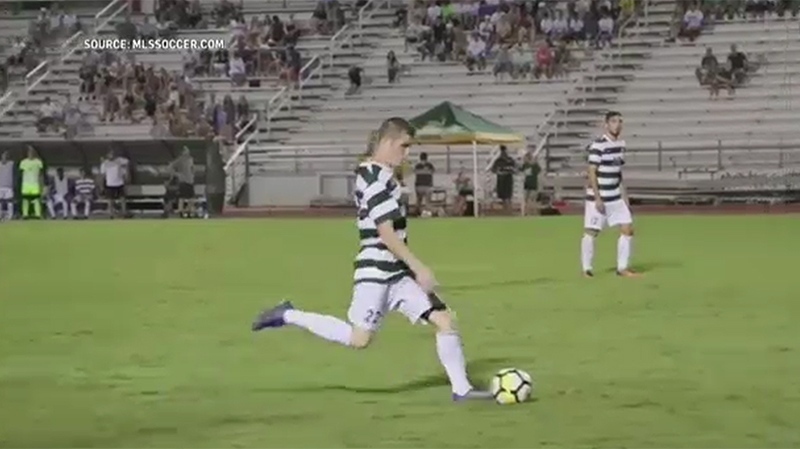 The 21-year-old Scot, who played two years at the University of Cincinnati before moving to Louisville, is a product of the Glasgow Rangers academy. Montgomery, a left-sided centre back, played 73 games in four years for the 49ers. He was the Conference USA defender of the year, a first team all-American and a semifinalist for the MAC Hermann Trophy awarded to the NCAA player of the year. “We felt he was a top pick in terms of a centre back at the Combine ... a player that we feel can have a career in the league,” said FC Dallas head coach Luchi Gonzalez. St. Clair, 21, who has represented Canada at the under-20 level, did not concede a goal during the NCAA tournament as the Terrapins won the 2018 national championship. Buchanan, who played just two years at Syracuse, was one of seven underclassmen to sign a Generation Adidas contract with Major League Soccer, deals that are attractive to teams because they don't count against the salary cap. Buchanan said waiting to hear his name called was tough. Amaya, St. Clair and Dorsey were also GA signings. There was some early drama Friday as Cincinnati took a timeout before the first pick, amidst talk of trade offers. But they opted to keep the pick to take the five-foot-four, 145-pound Amaya. The 18-year-old Californian had two goals and two assists in 14 games in his one year for the Bruins. San Jose chose 19-year-old Virginia Commonwealth midfielder Siad Haji, another Generation Adidas signing, with the second pick. Orlando City then took Florida International forward Santiago Pitino. The Colorado Rapids made a trade with the Chicago Fire to select University of Denver forward Andre Shinyashiki with the fifth pick. To get the Brazilian, Colorado gave up the 15th pick and US$100,000 in general allocation money. MLS commissioner Don Garber paid tribute to Sigi Schmid, the winningest coach in MLS history, prior to the draft. Schmid died on Christmas Day. He was 65. Garber said the MLS coach of the year award will be named after Schmid. Friday marked the first draft as Toronto FC GM for Ali Curtis, who was taken second overall in 2001 by the now-defunct Tampa Bay Mutiny. Two Canadians were taken in the first round in both 2015 and '17.